Anyway. It was a huge batch (about 4 dozens). I gave two dozens to my sister who brought it to their study group to share with 10 students. I gave another dozen to a friend of mine who I met up with that afternoon to help her with some documents. And I brought the last dozen to the office today. It was a hit. 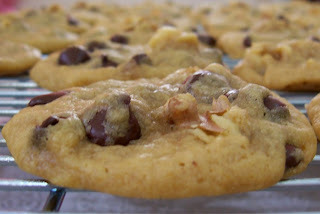 Oh, and imagine having this luscious chewy cookies with milk... Yummmy! 10-13 minutes for crispy cookies. ENJOY!!! 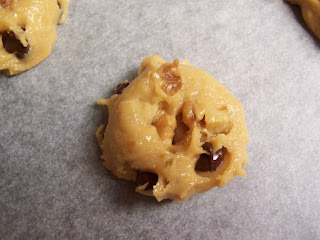 Note: this cookie dough works best as drop cookies. 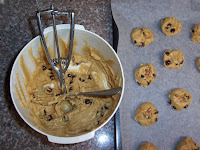 In other words, do not pat the cookie dough mounds once they hit the cookie sheet. This prevents the cookies from ending up too flat after baking and cooling. Another note: My ever-discerning sister thought this cookie was too soft and flat for comfort. (Some batches I baked for 9 minutes, some I baked for 13, as the recipe called, just to see which level of chewyness appealed to me more. I think I gave my sister the 9-minute batch.) Flavor-wise, she said she liked the earlier cookies I've made a lot more than these past two batches and asked me what I did different. 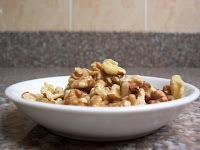 I've already tried out these recipes before and they normally passed my sister's test, so it is not just because I'd been trying out new recipes. So to answer her question, there are two major differences- one is that I used butter-flavored shortening/margarine. 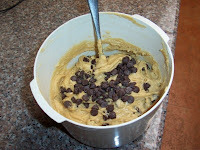 See, I always use unsalted butter for my cookies- even when the recipe calls for shortening or margarine. Second, I cannot find my favorite brand of vanilla in the supermarkets I go to lately. So I was forced to use this other brand that I did and still do not like to use because it gives my cookies this harshly artificial flavor. 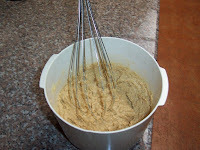 Vanilla and shortening, I think, are crucial ingredients of the cookie because they are the ones that essentially determine the flavor. Screw these ingredients up and you screw your cookie. So there. I will never experiment on my shortening and vanilla ever again.